“You can’t lead the people if you don’t love the people. You can’t save the people if you don’t serve the people.” - Dr. Cornel West, philosopher, political activist, and social critic. I heard the two inspirational quotes above at the Harlem brownstone where Langston Hughes lived, which is now the home of I, Too, Arts Collective, a non-profit organization dedicated to nuturing voices from underrepresented communities. This is where we had our fifth tday of training for Community-Word Project's Teaching Artist Training & Internship Program (TATIP). Many are afraid of conflict. Conflict isn’t bad. It is an opportunity to recreate new solutions. It forces us to connect deeply because it takes us out of our comfort zone. Social justice has to do with finding solutions for conflict. Therefore, conflict is the avenue for social justice. Conflict is an obstacle leading toward freedom. I, Too, Arts Collective is named after Langston Hughes’s poem, I, Too, which embodies the African-American experience in the 20th century. The Arts Collective hopes to preserve Hughes's legacy and offers a platform for emerging writers. The organization is fairly new and our TATIP group was lucky enough to attend the first workshop there. 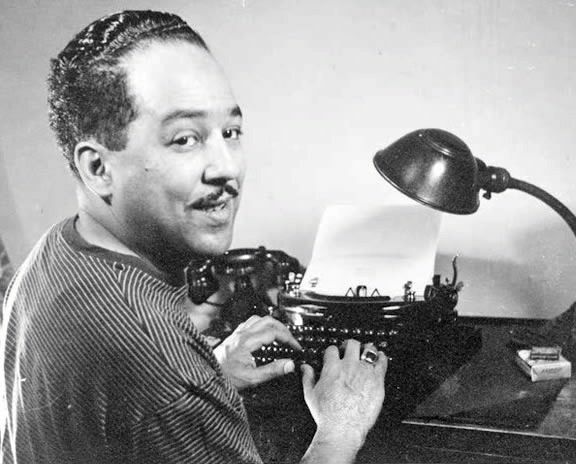 Langston Hughes’s piano and typewriter were still in the house, which added to the authenticity of being in the space. During this TATIP workshop, we did a variety of exercises. First, TATIP instructor Heidi Miller led us in a lesson. We observed the space and discused how our environment influences us and shapes many things. Then, we were asked to think of a question we would ask Langston Hughes. We wrote a line of poetry inspired by the questions we wanted to ask. Next, we had to come up with a word that captures the phrase we wrote. We came up with three movements to describe the word and embody them around the room in different speeds. Three of us volunteered to do our movements simultaneously in front of the room alongside someone reciting I, Too to see how the poem shaped our movements. Langston Hughes, “I, Too” from Collected Poems. Copyright © 1994 by The Estate of Langston Hughes. What is my underlying feeling or thoughts about education? In what way does this philosophy relate to me being an artist? Another exercise we did was go around the room and study quotes on the wall, discussing them in groups in terms of teaching for social justice. “Asking good, and then better questions is a work-of-art skill we must develop for a lifetime. Indeed, human nature responds only to the questions we put to it." -Eric Booth, actor and notable teaching artist, from "The Everyday Work of Art"
The next exercise we did was create a collage inspired by our writing, incorporating who we are as teaching artists, and including a quote from a pile we were given. The last exercise we did was create short skits based on difficult classroom management scenarios, and how to handle them. My favorite part of the workshop was when we watched a TED talk called, “Danger of the Single Story,” by Chimimanda Ngozi Adichie, a Nigerian novelist, nonfiction writer, and short story writer. In the TED talk, Adichie discusses the hazardous outcome of novels and stories with one-sided perspectives. This was my favorite workshop I've done with Community-Word Project thus far. It was an honor to be in Langston Hughes’s House discussing such important topics. Check out the amazing I, Too, Arts Collective and get involved to help this stellar non-profit to give back to the community.